Persistence is at the heart of every successful robotics startup, and a lot of pivoting. So the faster you can move from prototyping into customer development, market research and investor meetings, the more likely you are to find a good product/market fit. Robo-ops gives students an opportunity to engineer a solution to a future NASA mission and be a part of the NASA team. They get to compete and network with other students in their field and have fun while doing it all. NASA gets innovative ideas for its future missions and exposure to some brilliant talent that could soon be part of the NASA team. We all get smarter from this. Propulsion is provided by the conversion of wave energy to thrust. When the float rides a wave, spring-loaded wings on the propulsion unit pivot, but not too much, to mechanically convert that up-and-down motion into horizontal motion. We contacted several presenters from Automate 2013 in order to get a consensus of the conference as well as to give them the opportunity to pass on their experiences and impressions of the industry as a whole. Here are their responses. New Scientist: George Whitesides from Harvard University and colleagues have created a three-legged robot lined with tubes filled with a mixture of methane and oxygen. When an electrical spark ignites the gases, the combustion reaction generates bursts of pressure that propel the robot aloft. "By actuating all three legs simultaneously, we caused the robot to jump more than 30 times its height," write the team. As the height of the jump was limited by the size of the experimental chamber, they think it could spring twice as high without the attached tubing. Yesterday IEEE Spectrum reported that Willow Garage might be closing its doors, with information coming from several current employees. Then late last night Steve Cousins, President and CEO, released an official statement on their website: Willow Garage is changing Willow Garage has decided to enter the world of commercial opportunities with an eye to becoming a self-sustaining company. This is an important change to our funding model. The success of the PR2 personal robot and of ROS will continue. There are close to 50 PR2 robots in the world and Willow Garage support of the platform will not diminish. And of course, ROS, as an open source platform, will continue independent of our business model choices. In addition to Willow Garage, its supporters include the Open Source Robotics Foundation and all the other contributors in the ROS community (academic, industrial and individual) who have made it the platform of choice for Robotics. The statement doesn't confirm IEEE Spectrum's story but it doesn't dismiss it either. The original Spectrum story can be found here . British troops in Afghanistan are the first to use state-of-the-art handheld nano surveillance helicopters. The Black Hornet Nano Unmanned Air Vehicle measures around 4 inches by 1 inch (10cm x 2.5cm) and provides troops on the ground with vital situational awareness. The Black Hornet is equipped with a tiny camera which gives troops reliable full-motion video and still images. Soldiers are using it to peer around corners or over walls and other obstacles to identify any hidden dangers and the images are displayed on a handheld terminal. The Black Hornet weighs as little as 16 grams and has been developed by Prox Dynamics AS of Norway as part of a £20 million contract for 160 units with Marlborough Communications Ltd in Surrey. Mining practices have remained largely unchanged over the past 30 years. Accessible deposits are becoming harder to find with valuable deposits increasingly found only in remote areas of the world or in locations down hundreds of feet. These are expensive and dangerous to reach. Mining companies are going to have to deal with that and the best way is to automate the systems so that the human becomes the supervisor, rather than the direct worker. What is a Kiosk Robot? What would you do if you saw a robot approach you and start talking to you? How would you react if a robot looked sad when you walk away? Would you enjoy a robot rolling up to your table in a restaurant and showing you the menu? On Febuary 7th Channel 4 in the UK will air the special "How To Build A Bionic Man". From bionic arms and legs to artificial organs, science is beginning to catch up with science fiction in the race to replace body parts with man-made alternatives. How to Build a Bionic Man follows psychologist Bertolt Meyer, who has a bionic hand himself, as he meets scientists working at the cutting edge of research to find out just how far this new technology can go. Meanwhile, a team of roboticists create a complete 'bionic man' for the first time, using nearly $1 million-worth of state-of-the-art limbs and organs - the products of billions of dollars of research - borrowed from some of the world's leading laboratories and manufacturers. The little device is called a milli-motein — a name melding its millimeter-sized components and a motorized design inspired by proteins, which naturally fold themselves into incredibly complex shapes. This minuscule robot may be a harbinger of future devices that could fold themselves up into almost any shape imaginable. The device was conceived by Neil Gershenfeld, head of MIT's Center for Bits and Atoms, visiting scientist Ara Knaian and graduate student Kenneth Cheung, and is described in a paper presented recently at the 2012 Intelligent Robots and Systems conference. Its key feature, Gershenfeld says: "It's effectively a one-dimensional robot that can be made in a continuous strip, without conventionally moving parts, and then folded into arbitrary shapes." Momentum Machines is a Silicon Valley startup that is aims to build a fully automated gourmet quality burger production line. They plan to first open their own restaurant using the technology and then sell the hardware to others in the future. Here is their bullet points from the current alpha hardware: Our alpha machine replaces all of the hamburger line cooks in a restaurant.It does everything employees can do except better: It slices toppings like tomatoes and pickles only immediately before it places the slice onto your burger, giving you the freshest burger possible. Our next revision will offer custom meat grinds for every single customer. Want a patty with 1/3 pork and 2/3 bison ground after you place your order? No problem. Also, our next revision will use gourmet cooking techniques never before used in a fast food restaurant, giving the patty the perfect char but keeping in all the juices. It’s more consistent, more sanitary, and can produce ~360 hamburgers per hour. Simpler, stronger, and more precise. 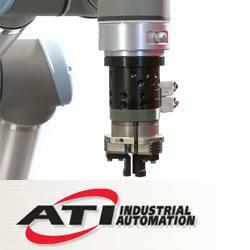 ATI Industrial Automation has developed a series of Manual Tool Changers that provides a cost-effective solution for quickly changing tools by hand. They feature a unique design that combines high strength, excellent repeatability, and a patent-pending screw-cam locking mechanism with multiple fail-safe features, which resists vibration and prevents loosening. These robust and compact Manual Tool Changers can handle payloads up to 80 pounds (36 kg) and pass pneumatics and electrical signals.